Dave Stevens completes the marathon! In early 2011 I realised I was getting old (late forties), and feeling really old. I was inspired though by the gymnastic achievements of my daughter and her friends at City of Preston Gymnastics Club, and also impressed how some people I knew were doing impressive running distances. So in June 2011 I did a 5k race and downloaded the Nike Plus running App for my iphone. By early July I was a client of Atherapy, experiencing right lower back and buttock pain, right groin and thigh pain and lateral right knee pain. 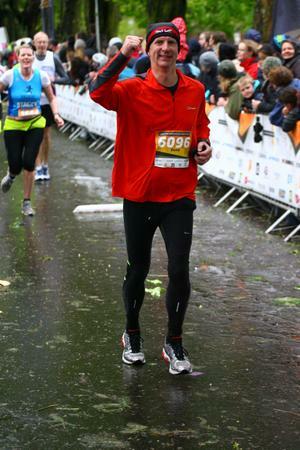 Last week (April 2012) I did a full marathon in just over 4 hours and this would not have happened to me without the expertise, guidance and support from Phil Isherwood at Atherapy. So being a Virgin Active member made it easy for me to access the Atherapy services, and I had realised that I was going to need some help to stop the legs and back hurting. But what happened in ten months to truly make me fit, healthy and bring back a real spring in my step? Well, Phil with the sports physio approach didn’t just fix the one problem, we worked together over a number of months to build core strength, build leg muscle, rebuild my running form and technique, improve diet, bring flexibility back, sort out balance, consult with a podiatrist for choosing correct stability running shoes and force me to do ridiculous squat variants. The week before the marathon he even told me how to tape my feet correctly to avoid a blister problem. So ok, we did lots of hard work and i trained hard around the sports physio sessions – but why was Atherapy so important? I think this is best described with the patella tendon problem I started to experience when I was upping my running miles at faster speeds. With no expert guidance – you read about the problem on the internet, self diagnose (probably incorrectly) and either give up or damage yourself. The knees are a sensitive topic, and all non runners never hesitate to remind you about the myth of how running ruins “your knee joints”. Phil diagnosed the problem, and we worked on a set of exercises to build strength in the thighs and tendons around both knees. It wasn’t improving much over the weeks, and was starting to demoralise me, but I kept up the weights and squats work. I’d already booked a date with a marathon for end of April, and a sequence of training races as part of the plan. Luck intervened in the form of flu and enforced a few days in bed. I got rid of the flu, did a half marathon race, 15 minutes off my previous best time and no knee pain! The knees have been pain free since, much to my delight. So I approached the week’s taper prior to the Manchester marathon, having changed my running style, run 500 training miles and lots of gym work, with a plan to do less than 4 hours. The weather was gruesome, and I started too slowly (!) but was happy with 4 hours 7 minutes – and most important I was injury free the day after. I’m still not sure why I booked the marathon. Maybe because I knew I had to try for it. Many thanks to Phil at Atherapy – we now have a new plan for work over the summer taking me into the next marathon and beyond….working with Atherpay has been one of my wiser investments.